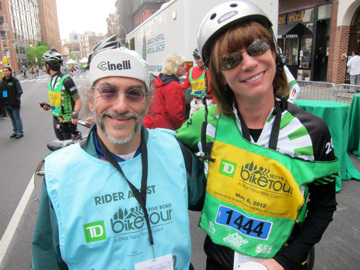 Danny Lieberman with Transportation Commissioner Janette Sadik-Khan at the 2012 Five Boro Bike Tour. Danny Lieberman’s valuable 2007 Moulton bike, which cost $13K when new, is being raffled by the Five Borough Bicycle Club. Well-known sf fan Lieberman, who died of leukemia in October 2012, was also a leading New York-area bike enthusiast. He founded the “ebikes” listserv in the 1990s, was a mainstay of the Five Borough Bicycle Club and helped organize various NY-area biking events. This entry was posted in In Passing and tagged Danny Lieberman by Mike Glyer. Bookmark the permalink.